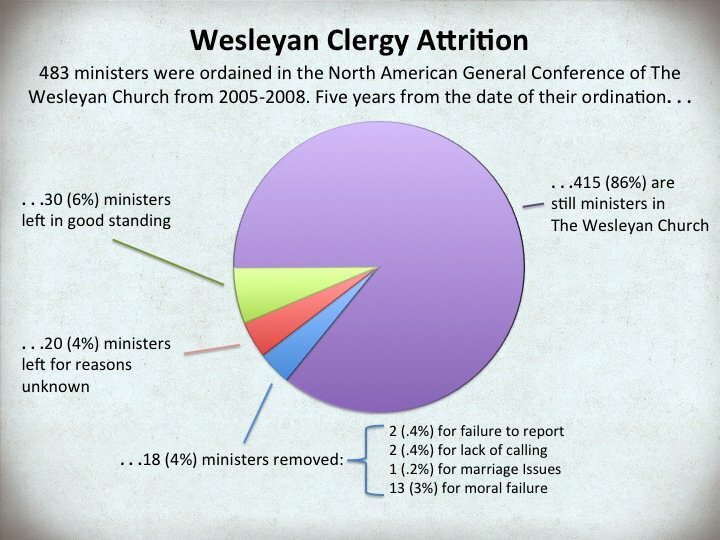 Please forgive me for the sensational title but the news about Wesleyan pastoral retention is indeed shocking. So, those of us here in the Education and Clergy Development office decided to collect and analyze the actual numbers for Wesleyan clergy. We ended up plowing through the journals from all of our districts for the last five years. ** And, as you can see below, our findings are surprisingly positive. Clearly further research is needed to answer important additional questions. What is the attrition rate pre-ordination or after 10, 15, 20 years? What factors influence attrition...education, church size, age, region? The answers to these questions and many others will help us steward our resources and target our energies to strategically equip, support and care for Wesleyan Clergy for years to come. But for now, let's celebrate and thank our gracious God for this good news. . .Wesleyan clergy are persevering! *We searched far and wide for the studies behind these kinds of statistics and we were hard pressed to find quality research that espoused consistent numbers and/or supported such high rates. **This data was collected from paper district journals so special thanks to Joel Liechty and Dave Higle for plowing through all those pages. And pray for us as we work with the Communication and Administration division to accelerate the digitization of our denominational data. After 17 years as a local church pastor, Aaron's father stepped out in faith as an evangelist. In an age where camp meetings and revivals are scarce, he was a little concerned for his dad. ​"I would have never imagined I would be a pastor today." Saying yes to God may take you places you couldn't imagine. For Kingswood University student Lindsay Miller, the journey of obedience has led her to the streets of New York City, Haiti, and Europe. OKWU's revenue and enrollment are growing consistently, thanks in large part to their mission. Here are three things you should know about how OKWU is furthering the vision of The Wesleyan Church. Chaplain Jim Miller's ministry includes nurturing the living, caring for the wounded, and honoring the dead. Living alongside his fellow soldiers, Chaplain Miller exemplifies ministry of presence. Houghton College is The Wesleyan Church's oldest institution of higher education. Here are three reasons Houghton College exemplifies Wesleyan commitment to formative higher education. Why are Wesleyan Higher Education Institutions thriving? Get a snapshot of the state of Wesleyan Higher Education here.